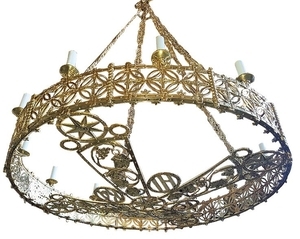 Church chandelier (khoros) - 34-2 (12 lights) - Istok Church Supplies Corp. Traditional church chandelier (khoros, 12 lights). Brass, casting, hand-polishing. Diameter: 51.2'' (130 cm), height: 66.9'' (170 cm). Thank you for the amazing work you do. Your service was excelent with my first order. Please continue the good work. God bless you and we are really happy with the first package of vestments that arrived last week. Thanks again and we will continue to do business with Istok. Thank you so much for the incense, I really appreciate your quick service. I have received the icon yesterday. Beautiful icon, thank you for your very good service. Thank you -- my order arrived yesterday and I am very happy with it! My vestments are beautiful! I thank you and your business associates for your help and I can guarantee that I will be using for your services in the future. Once again thank you very much.